Once Christmas is around the corner, this question starts coming once again. We often feel hopeful as we look to the new year. We want change. To develop deeper relationships, healthier habits, new skills. But what’s often at the center of our resolutions? Us. We can lose sight of Christ as we decide what we want to do to bring our change. Instead, we can think a little differently. We can look to where God has placed us and our responsibilities to lead in these areas. We can ask what God might desire for our 2019. What about the God-given responsibility of your group? Here’s four Gospel-centered resolutions to keep your group centered on conforming to the character of Christ well into 2019 and beyond. “The present, the gift, is for all the people. The Savior from sins is for all the people; the Messiah-King is for all the people. Repent of your sin and believe in Jesus, who died for sins and rose from the dead that you may have life. “See, now is the acceptable time; now is the day of salvation!” (2 Cor. 6:2).” (Gospel Foundations, Volume 5). Confession and repentance. They are core to Christianity, but are they always core to our churches and groups? It feels better to talk about how we “messed up” without going to the base level and calling the things that are sin sin. We can even simply focus on “discussing challenging topics” and “celebrating together,” both of which are good. Yet, in 2019, let’s add in a regular rhythm: confession and repentance. It might be seeking out a group member to hold each other more accountable one-on-one. It might mean gathering as a group and spend time in prayer, repenting before the Lord. No matter what it tangibly looks like in your group, let’s regularly repent. “All these promises and more are fulfilled in Jesus. Jesus is not only the promised eternal King; Jesus is the evidence that God keeps every one of His promises, both now and forever.” (Gospel Foundations, Volume 5). Sometimes, we can become frustrated when it seems like God isn’t answering our prayers — not in the way we want or in the timing we hoped. But what’s the bigger picture? Jesus is the fulfillment of so many of the promises of the Lord, and we can rest in that. In 2019, let’s refocus our groups on finding Christ in all of Scripture instead of finding our anger at the way we wish things were. Let’s not just know that the Lord is good and faithful to help us, but let’s find specific verses that remind us of specific promises. Let’s consider memorizing these veres as we keep our groups centered on the faithful promises of our Lord. Often, we like to focus on the ways we can “succeed” each new year. But, where do we find success as the focus in the Gospel? Money, power, fame, pleasure. None of this is to be treasured above all else. Achieving this is not biblical success. Instead, obeying the Lord, being a faithful witness, seeking to bear each other’s burdens, being ambassadors of reconciliation — this is success. In 2019, let’s shift our focus in our groups from how we can be “a more successful group” in terms of what the world values. Instead, let’s try to focus on obedience, on prayer, on supporting each other, on treasuring Christ and magnifying Him above all else, even when that leads to the opposite of success and even suffering. We often feel empty. Why can’t I seem to be as productive as I want? Why do I get so angry at my kids? Why do I slide into that temptation, again and again? We are fallen humans who live in a sin-stained world, and we can be frustrated as, during our group discussion about our failures and the failures of the world around us, we just seem to see emptiness. In 2019, let’s flip this focus. Instead of being pain and incompleteness, let’s look to Christ in our groups. Let’s continually point out how He brings fullness even when we’re empty. We fail each other. Christ never fails. We see so much division. Christ is about reconciliation and redemption. We’re empty. He’s the fullness this world needs. The Gospel? It’s the foundation to our Group. This week, we’ve been exploring for more Gospel insights to guide you in finishing out this year as we head towards 2019. But your journey with the Gospel can go far beyond these posts. We have an entire Bible-study line that walks you through the storyline of Scripture to point you to the Gospel. It reveals how Jesus is the hero from beginning to end. Sound too good to be true? Try it. Find a free download of study PDF and video content here. In our Christmas narratives, where does our story end? We start with the journey of a carpenter and his wife. We move into the no-room-in-the-inn, the stable, manger, and swaddling clothes. Then, to the angels, shepherds, and star guiding the wiseman. Finally, to the birth of our Lord and Savior. This is an incredible story with power beyond comprehension. Our Christmas narrative often wrap up with praising Him: the Savior born, the baby come, and the Light of the World. This profound mystery should never leave us. Yet, we can praise this incredible Savior even more when we see Him beyond just the Christmas story. What if Jesus was a thread throughout all of Scripture, shown as hero from beginning to end, not just the hero on the Bible’s pages only in the Christmas narrative and Jesus’ incredible ministry on Earth? The Gospel touches all pages of the Word of God and deeply impacts every season. We find Christ throughout scripture in promise. The baby in the Manger came to give us everlasting life. This redemption story is woven from beginning to end as we see that the Gospel doesn’t just affect our life after death, but the promise changes our life before death. For? We are living in light of death. The reality that our King died and was raised again. That we live, knowing one day we will give account before our Risen King but that He’s also given us everything we need to life for Him in the here and now. We find Christ throughout Scripture in perspective. We waited a long time for the Christ’s first coming, the baby in the manger. But, through the Old Testament prophecies to the New Testament declarations, we gain a new perspective: he’s coming again. We eagerly long for that day. We find the Gospel empowering our waiting, changing our perspective to be one of hope: hope in the One who gives strength for today and is the reason for all days. We find Christ throughout Scripture in presence. Christ became present to us, in a new way, while He walked on earth for over thirty years. But God was with His people in other ways, both before and after. He has given us the helper, the Holy Spirit (John 14:26). We know that Our God does not leave or forsake (Deuteronomy 31:6). We find everyday Gospel power in knowing that He is with us, and we can seek to bring His presence to others, being ambassadors of reconciliation (2 Corinthians 5:11-21). His presence, so powerfully shown through the manger, has implications for us spanning not only into our preset but into our past and future. As Thanksgiving slides into Christmas and New Years, we often slide straight through one year into the next (and the next and next). We don’t pause nearly as often as we could (and maybe should). What could happen if we did? What if we took time to look back at our Group’s year–in light of the Gospel? We see our God listening. Listening to His people and being moved to act and speak. Looking back at your group this past year, how have your members reflected the character Christ through mirroring such listening? What struggles have surfaced, but people listened to each other and were moved to act and speak? What was celebrated, and people listened to each other’s stories of triumph and praised? The Gospel is seen through each long and short moment of listening as we care for each other just like Christ cares for each one of us. This is Gospel evidence in your group’s year-in-review. Sometimes, we can look back at our group’s year and see difficult moments: when conflict arose, when jealousy surfaced, when tension was high. Yet, what about faithfulness? What about the moments when members disagreed but agreed to hear each other’s opinions? What about when sin emerged, but other sinners rallied together in prayer? What about when conflict began, but the Lord worked through it to bring reconciliation on even deeper levels than we knew were needed? Looking back at your group’s year, don’t neglect thankfulness for the evidences of Gospel-grace in your group’s faithfulness towards each other and, ultimately, towards the Lord. Our God is a God who defeated sin and death. He is the Light of the world, and He brings light into our worlds (John 8:12). This past year, we must look back at our groups and celebrate the victories over sin. They may be daily surrenders of selfish ambition, complaint, or self-focus and daily choosing to be Christ-dependent. They may be breakthroughs in lifelong, destructive addictions to make room for life-giving habits. For these moments of light breaking into darkness in our groups, we can be thankful for this evidence of the Gospel at work. “But there’s one dominant theme: ‘You will know that I am the Lord’ (see Ex. 7:17;8:10,22; 9:14,16,29; 10:2). God let everyone know that He alone is God. We must not miss this overarching theme … God’s mission is to be known and worshiped.” (Gospel Foundations, Volume 2). 2018 may have been a year of deep pain even amid moments of incredible joy. Yet, how does the Gospel show itself in it all? We can see the Gospel at work throughout our year when we find the moments focused on mission: knowing Christ and making Him known. This results in and often comes from a heart of worship. For the moments that your group focused on worship through speech, song, and service, we can stop to give thanks. This is evidence of Gospel transformation. The Gospel? It’s the foundation for our Group. And, we’re only beginning to explore this. Check back on the blog this week for more Gospel insights to guide you in finishing out this year as we head towards 2019. And you don’t even have to wait till then. We have an entire Bible-study line that walks you through the storyline of Scripture to point you to the Gospel. It reveals how Jesus is the hero from beginning to end. Sound too good to be true? Try it. Find a free download of study PDF and video content here. Gospel. We speak it in our churches. We hope it saturates our homes. We pray it impacts our groups. But sometimes we become so familiar with the word that we lose sight of its power. The gospel is the profound, life-changing truth of Jesus. “Jesus is God’s word to us, breaking through our dark, silent prison and saying ‘let there be light!’” (Gospel Foundations, volume 1). It’s that moment when you realize your heart cannot begin to hold all the love Jesus has for you. It’s when you realize that moralism is empty and all of life is really about His life, death, and resurrection. When the light of the gospel transforms just one individual, it also has the power to illuminate your group, your church, and even your entire community. How can you see your group in the light of this gospel? We’ve all been there. Tired. Close to burnout. Knowing it’s because of Christ we lead our group but feeling like we need a little more grace and a lot more of Jesus to open up our space, our time, and our hearts yet again. “How else could you describe the creation of everything unless you’re first introduced to the Someone who preceded everything? That’s the whole point of Genesis 1:1. The God who simply is, who preceded everything and is not dependent on anything, created all that we know and all that we don’t know as well.” (Gospel Foundations, vol. 1). For us to see our groups in light of the gospel, we must begin by looking at the gospel’s beginning, The Creator. The One who is not dependent on anything but who we depend on for everything. Before we take more gospel-centered steps, we must turn to Him, seeing Jesus and holding fast to the reality that He is the way, truth, and life who supplies all we need (John 14:6; Philippians 4:19). 2. Look through the lens. What is the foundational, gospel lens? We can look at our groups through the lens of the truth of Scripture. “The Bible is a God-centered book. We have been given Scripture so that we might know God. That means when we read Scripture, we should focus primarily on what we can learn, love, and embrace about God and His Son, Jesus” (Gospel Foundations, volume 1). We don’t let our judgments, our complaints, or even our pride about our groups taint how we see our members and interact with them. Every thought that is not in obedience to the truth of Scripture, we take captive (2 Corinthians 2:5). This is our lens. What does Jesus show us about seeing people? Instead of responding from our frustration, our desire to please others, or even our selfish ambition, we have compassion (Luke 7:12-15). We speak truth in love (Ephesians 4:15, 25). We see people through the fact that Christ died for them just as He did for us. That we show the fruit of the Spirit in our actions: being loing, kind, faithful, and self-controlled (Galatians 5:22-23). That we love because He first loved us, regardless of if we feel like it or not (1 John 4:19). 3. End with wonder, not wondering. “When there was nothing but nothing, God was, and that ought to create in us a sense of wonder about Him that trumps all our other wonderings” (Gospel Foundations, volume 1). At the end of the day, the gospel leaves us in wonder. Who are we that Christ died for us? Who are we that we experience reconciliation with a Holy God? This worshipful wonder can quiet our wonderings, frantic thoughts, and worries. We don’t have to question the power of the gospel. We can rest in the fueling wonder, knowing that it is by Him, for Him, and to Him that we live (Acts 17:28). The gospel? It’s our foundation. And, we’re only beginning to explore this. Check back on the blog all this week for more gospel insights to guide you in finishing out this year as we head towards 2019. And you don’t even have to wait till then. We have an entire Bible-study line that walks you through the storyline of Scripture to point you to the gospel. It reveals how Jesus is the hero from beginning to end. Sound too good to be true? Try it. Find a free download of the Bible study PDF and video content here. It’s getting to be that time to make plans for your group’s study focus after the new year. I think we have some options that will really bless your group as you kick off 2019! I’d like to share with you some studies in smallgroup.com that you can use, and even customize to make them your own, if you choose. Not a smallgroup.com member? No problem! Just go to www.smallgroup.com and click on the 30-day free trial icon to access these studies! 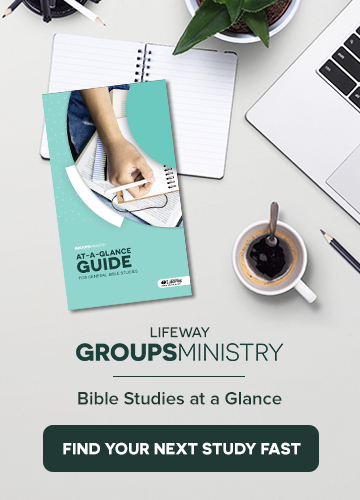 If you are already a member of smallgroup.com, I hope these studies will be new to you as you seek your next small group series. As you continue to read, you’ll find 3 studies that I believe will kick off your 2019 well as your group seeks after Christ, finds who you are in Christ, and lives out the mission of Christ. This series covers six passages in the book of Acts to explore what it means to live in a missional fashion. This is a great way to start the year, as we seek to live on mission in every area of our lives! Session 1: Acts 2:41-47 – As you go in your walk with Jesus, do so in community. Session 2: Acts 4:1-20 – As you go and share the gospel of Jesus Christ, do so knowing you are loved by God and emboldened by His Holy Spirit. Session 3: Acts 6:1-7 – As you go about living a missional life, your testimony is influenced both by what you say and what you do. Session 4: Acts 9:26-31 – As you go about making Christ’s name known, do so in boldness. Session 5: Acts 17:16-32 – As you go about reaching your world today, you must be willing to meet people where they are, yet not compromise the truth of the gospel. Session 6: Acts 28:23-31 – As you go about your walk with Christ, it is imperative that you allow the Lord to work in your circumstances, so you might use any resources you have to proclaim His glorious name. This 6 week series explores six identity traits of Christians. It is necessary for us to be reminded often of who we are in Christ, as we fight against society telling us otherwise. This series will focus your group on who you all are as followers of Christ, as you are sent back into the world reminded of your true identity! Apart from their own conduct, all who are in Christ are saints of God. We did not accidentally become Christians, but because of God’s great love, He chose us before the foundation of the world. Christians are completely forgiven, for when Christ died, He died for our sins past, present, and future. Christians are co-heirs with Christ and enjoy the blessing of a sure and certain inheritance. Because Christians are sealed by the Holy Spirit, our relationship with God and our eternity are secure in Him no matter what happens in our lives. Because Jesus rose from the grave and now reigns at the Father’s right hand, Christians share in His victory no matter what comes against us. This 6 week series gives focus to walking more closely with God through prayer. Throughout this series, you will be challenged to step outside of your comfort zone when praying, which leads to a deepened trust in Christ. God sacrificed His Son’s life in order to save yours. Praying for salvation and following Christ demands the full submission of our lives. The appropriate response to God’s holiness is surrendering your life in service to Him. Sometimes growing spiritually involves great struggle, even to the point of brokenness. Wherever God leads us, we can follow, because He has been and always will be faithful. God does not expect His people to exercise perfect faith but rather humbly dependent faith that cries out to Him for help. Session 6: A Prayer of Obedience – Acts 26:9-23 When we pray for God to use us it is not always comfortable or safe. There are so many great short and long term studies on smallgroup.com, as well as thousands of individual studies. A few others that I’d encourage you to check out are: “The Hebrews Initiative”, which is a 12 week study on the superiority of Jesus, “Marriage Matters”, which is a 6 week focus on the core issues in marriage, and “The Life of David”, which is a 9 week study on David’s life being in God’s hands at all times. No matter what you choose, we trust that you’ll be encouraged, challenged, and pointed to Jesus in each of these studies. I’m excited for you as you lead your group into 2019! Each week on Thursdays we highlight a trustworthy discipleship resource that can help you in your mission to make disciples. This week’s post is from Explore the Bible: Adults Personal Study Guide Winter 2019, Session 2—Not Alone. Fill out the form at the end of this post by Friday, November 16th at 11:59pm to enter for a chance to win this free resource! Loneliness is more than location. We can be in a familiar place, yet still be alone. We can feel alone in a room full of people or walking down a city street surrounded by a mass of people. The feeling of aloneness can be overwhelming. Jacob knew loneliness. After tricking his father Isaac into giving him the patriarchal blessing, Jacob was forced to flee his home. Leaving behind his worried mother, angry brother, and deceived father, he left Beer-sheba and set out for Haran, the home of his mother’s brother. When the sun had set, he stopped to rest at a certain place. This place was far from home, far away from his mother’s tender touch, and far away from the luxuries afforded him as Isaac’s son. In this place, alone, there was no need for deception or trickery. Most likely, his thoughts were now filled with fear. Would Esau follow him and kill him? Would he have enough food or water? Would he find his way to Haran? Would his uncle welcome him under these circumstances? His deceptive actions brought him to this uninviting and uncomfortable place with only a stone for a pillow. Alone and exhausted, he watched the day turn to night as he lay in that place. The consequences of our sinful actions often take us to places we did not imagine. We fantasize of riches and fame, but sin offers no such reward. Like Jacob, we may find ourselves without family and home if we bite at Satan’s temptations. In this solitary place, sleep overtook Jacob and he dreamed. In his dream, Jacob saw a stairway that reached from earth to heaven. God’s angels were going up and down on it. The stairway reminds us of God’s personal involvement in the affairs on earth and in the hearts of humanity. While people, like Jacob, may leave God out of their lives, God never deserts them. Notice the movement of the angels on the stairway. They were already on earth, traveling up to heaven and then coming back down to earth again. God’s angelic army had been busy on earth, long before Jacob’s time. Not only were the angels accomplishing God’s purposes on earth, but by ascending up the stairway, they were in constant communication with heaven. Nothing on earth escapes the watchful eye of God. Even in this solitary place, Jacob learned God was at work. As far as Scripture reveals, this was Jacob’s first encounter with God. Introducing Himself, God used the name Yahweh, the personal name for God, meaning the self-existent, eternal God. Just as God appeared to Jacob’s grandfather and father, He appeared to Jacob personally. Jacob was about to learn that hearing the stories of God is not the same as having a personal relationship with Him. God extended to Jacob the covenant He made with Abraham and Isaac, promising him offspring, land, a blessing through him, divine protection and presence, and that He would see Jacob safely home. God would appear to Jacob several more times, but this first meeting was significant because Jacob learned God was interested in him and was at work in his life. As God approached sinful Jacob, Jesus comes to us in spite of our sinfulness. He loves us as we are and blesses us though we are undeserving. By placing our faith in Jesus, our lives will never be the same. We can be confident in knowing that God is with us and guides us to fulfill His purposes in and through us. Each week on Thursdays we highlight a trustworthy discipleship resource that can help you in your mission to make disciples. This week’s post is from Explore the Bible: Genesis – The Life of Jacob Fill out the form at the end of this post by Friday, September 7th at 11:59pm to enter for a chance to win this free resource! respond after you discover that you were deceived? You view a social-media post that promises a free getaway, noticing that it came from a friend. You click on the image only to discover that the free getaway has some catches. You’re required to use a specific airline and a specific booking agency. You also discover additional fees for the “free” trip. You then discover that if you share this post with other people, some fees will be waived. Suddenly you’re not nearly as interested in the trip. Abraham died when he was 175 years old, leaving behind two sons, Ishmael and Isaac (see Gen. 25:7-9). Because Ishmael wasn’t the promised son (see 17:18-19), Isaac received God’s blessings (see 25:11), including the covenant God had made with Abraham (see 12:1-3; 26:1-5). Isaac married Rebekah (see 25:20), and they had twin boys, Esau and Jacob (see 25:24-26). Born only seconds before Jacob, Esau was the oldest and, as a result, first in line for his father’s patriarchal blessing. But God selected Jacob instead to be the patriarch (see 25:23). Although the word patriarch doesn’t appear in the Old Testament, the New Testament uses this descriptive title to refer to Abraham (see Heb. 7:4), the sons of Jacob (see Acts 7:8-9), and David (see Acts 2:29). Isaac’s family was divided by marked favoritism. Isaac favored Esau because, like him, Esau was an outdoorsman, while Rebekah favored Jacob (see Gen. 25:27-28), creating conflict and competition between the two sons. One day when Esau came home exhausted and hungry from hunting, Jacob offered his brother a meal, only after Esau promised him the older brother’s birthright (see vv. 29-34). As Genesis 27 opens, Isaac was old and nearly blind (see vv. 1-2). Before giving Esau the patriarchal blessing, Isaac asked him to hunt some wild game for a meal. Rebekah, who was secretly listening, quickly devised a deceptive plan whereby she cooked a similar meal, dressed Jacob to resemble Esau, and had him steal his brother’s blessing (see vv. 3-17). Although the plan was his mother’s, Jacob eagerly went along. Because he was ambitious, his only concern was that he might be caught (see vv. 11-12). But when his mother agreed to take his father’s wrath (see v. 13), he concluded that the reward outweighed the risk. made with Abraham (see 12:1-3) and extended through Isaac (see 26:1-5). When Jacob came to his father, posing as Esau, Isaac sensed something was wrong. After lying about his identity, the meal, God’s help, and his appearance, Jacob deceived his father. what can believers gain by setting an example? The kiss was a formal part of giving and receiving a blessing. Here it marked the end of the ceremonial meal (also a formal part of the blessing) and the beginning of the spoken blessing. Isaac’s doubts about his son’s identity had been removed. How was Isaac so easily deceived? His preferential love for the older son led to his deception. He heard (see 27:24), tasted (see v. 25), touched (see v. 26), and smelled (see v. 27) what he was looking for—Esau. Because of his unrelenting favoritism, he believed because he wanted to believe. What are some ways favoritism is manifested in the church? What are some consequences that result from favoritism? How can we prevent it? Through an act of deception, the blessing went to Jacob. Although Jacob took what God had promised him (see 25:23), this deception wasn’t God’s doing. We can’t justify using deceptive means to obtain worthy ends. Jacob’s selfishness and transformed him into a man He could bless. What are some occasions in Scripture when God accomplished His purposes despite a person’s sinful conduct? What can we learn about God from those examples? ❯ Believers are to act with integrity and transparency when dealing with others. ❯ Believers must guard against favoritism, knowing it leads to personal deception. ❯ God can bring to pass His sovereign purpose despite the selfish actions of a sinful person.